These methods find a subject regardless of the currently open job or whether a job is open at all. Scanning a /%K barcode finds a subject by their subject key. This barcode can be scanned in most areas of the software. If the subject is in the currently open job the software will jump to the subject in question. If the subject is not in the currently open job or no job is open at all, the software will open the correct job first then jump to the scanned subject. 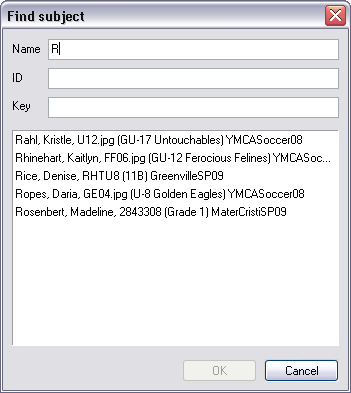 The Find Subject window allows a subject to be found by their lastname, ID or key. The window can be opened from the File menu in Details Mode or Images Mode (File>Lookup>Subject). The Subject Lookup (File>Lookup>Subject) makes use of the lastname, firstname and unique fields. Lookups by name or ID can only work if these fields are 'global' - they must be available for all jobs regardless of season, workspace or account. For this reason these three fields must remain in *.*. * area of tsAdmin. To use the Find subject window enter either the lastname, ID (unique field) or key for the subject. As each character is entered the results window will return a decreasing number of results. At any point the user may select the desired subject and click OK to open the relevant job and go directly to the subject in question. Fig 1. The Find subject window.